Kimilili Boys and Moi Girls High School Kamusinga are the new East Africa School Games handball boys and girls champions. Kimilili edged out rivals St.Peters Chesirkiwa in an entertaining final at Eldoret Sports Club while Kamusinga beat Uganda’s Mbogo to claim the crown. The 8 times national champions Kimilili played in their own class defeating their opponents 30-20 to scoop the title without losing a single match in their group stages. 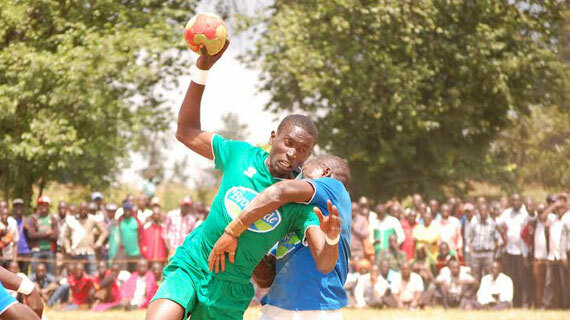 Kimilili eliminated defending champions ES Kigoma of Rwanda 28-18 in the semi-final while St.Peters beat Kibuli from Uganda to sail through to the finals. Kimilili Coach Gerald Juma termed the victory a milestone since it was their maiden win in the regional games, “we are very delighted by the win and the boys were ready from the start. They promised victory and through hard work and discipline, they achieved their target. We never lost a single match because we were mentally focused to achieve the ultimate crown,”Juma said. St. Peters finished second for the second time after coming behind ES Kigoma in Rwanda last year. "Next year we want gold because that is the only title missing in our cabinet." In the girls category Kamusinga registered 26-16 win against Mbogo.